Ivoe Williams, the precocious daughter of a Muslim cook and a metalsmith from central-east Texas, first ignites her lifelong obsession with journalism when she steals a newspaper from her mother's white employer. Living in the poor, segregated quarter of Little Tunis, Ivoe immerses herself in printed matter as an escape from her dour surroundings. She earns a scholarship to the prestigious Willetson College in Austin, only to return over-qualified to the menial labor offered by her hometown's racially-biased employers. Ivoe eventually flees the Jim Crow South with her family and settles in Kansas City, where she and her former teacher and lover, Ona, found the first female-run African American newspaper, Jam On the Vine. In the throes of the Red Summer--the 1919 outbreak of lynchings and race riots across the Midwest--Ivoe risks her freedom, and her life, to call attention to the atrocities of segregation in the American prison system. 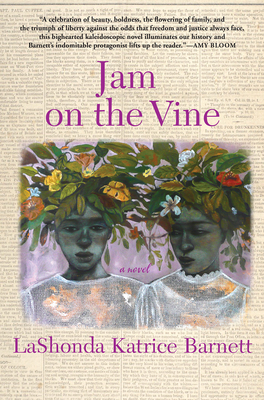 Skillfully interweaving Ivoe's story with those of her family members, LaShonda Katrice Barnett's Jam On the Vine is both an epic vision of the hardships and injustices that defined an era and a moving and compelling story of a complicated history we only thought we knew. LaShonda Katrice Barnett was born in Kansas City, Missouri in 1974 and grew up in Park Forest, Illinois. She is the author of a story collection and editor of the volumes: I Got Thunder: Black Women Songwriters On Their Craft (2007) and Off the Record: Conversations with African American & Brazilian Women Musicians (Rowman & Littlefield, Spring 2014). For short fiction she received the College Language Association Award and the New York Money for Women/Barbara Deming Memorial Artist Grant. Recent awards for writing and historical fiction research include the Rhode Island Council for the Humanities & National Endowment for the Humanities grant #45.129; Mystic Seaport's Munson Institute of Maritime Culture Paul Cuffe Memorial Fellowship; Sewanee Writers Conference Tennessee Williams Scholarship and the Provincetown Fine Arts Work Center Advanced Fiction fellowship. A graduate of the University of Missouri, she received an M.A. in Women's History from Sarah Lawrence College and the Ph.D. in American Studies from the College of William and Mary. She has taught literature and history at Columbia University, Sarah Lawrence College, Hunter College and Brown University.